For the first time in the organization’s history, Boy Scouts of America will allow openly gay members into the organization. Photo by REUTERS/Darrell Byers. For 103 years, Boy Scouts of America forced openly gay members out of the organization. On Wednesday, that rule officially came to an end. 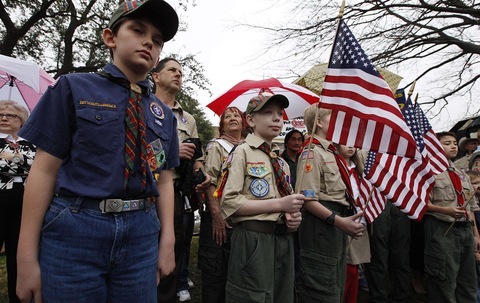 The organization voted to lift the ban against openly gay Boy Scouts last May. The ban, however, remains in effect for openly gay leaders within the organization who are 18 and older. The decision came after intense national debate, both within and outside of the organization. PBS NewsHour examined both sides of the conversation last February with Zach Wahls, author of “My Two Moms” and an Eagle Scout who founded “Scouts for Equality,” and President of the Southern Baptist Convention’s Ethics and Religious Liberty Commission Richard Land. Wahls believed that if the ban was enforced, Boy Scouts of America would no longer connect with his generation. Conversely, Land believed that lifting the ban on gay Boy Scouts would not be in keeping with all sponsors’ and parents’ beliefs. Before the organization voted to lift the ban, NewsHour spoke with Boy Scouts across America who were torn between their loyalty to the organization, and their beliefs in gay rights.